I have not been on top of my game recently, and I apologize for that. I’ve had a lot more schoolwork and mentoring work on my plate than I expected to over the past month, and the quality of my articles has suffered so that they have not been the fountains of knowledge that they used to be. Another problem that I’ve been having recently is that I don’t have as strong of a niche as some of my fellow writers on this website. 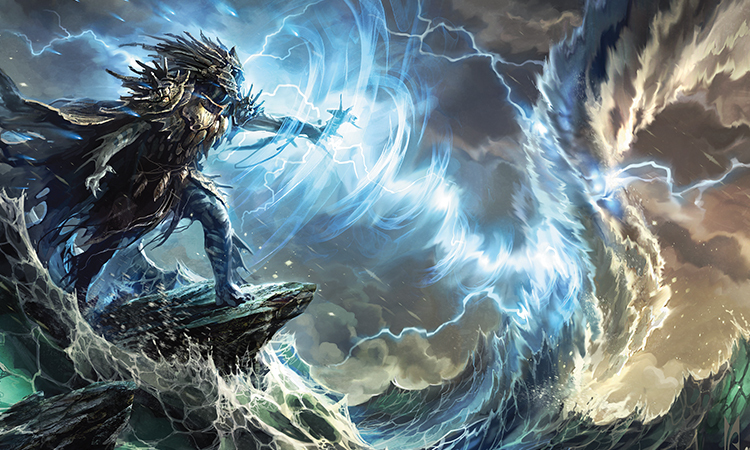 Jason Alt gets to handle a format of otherwise “unplayable ten drops” for people who want to pretend that they still play Magic, and Jim Casale handles the “grinder” aspect of the game to help all of you who actually do play Magic. Sigmund is skilled at tying in “real life” finance and investing to the Magic market, and he’s also got a pretty solid handle on this Old-School Magic thing. I should probably sit down and talk to him about that format one day, but I just keep getting too distracted. “Tell me about the war, Grandpa!” I ask him, but then it’s time for his afternoon nap and I have to wait another day. Oh, and I try to focus on collection buying and building a personal brand as a vendor. That’s supposed to be my area of expertise, if you can call it that. There’s an inherent problem with collection buying though. Well, not collection buying itself. 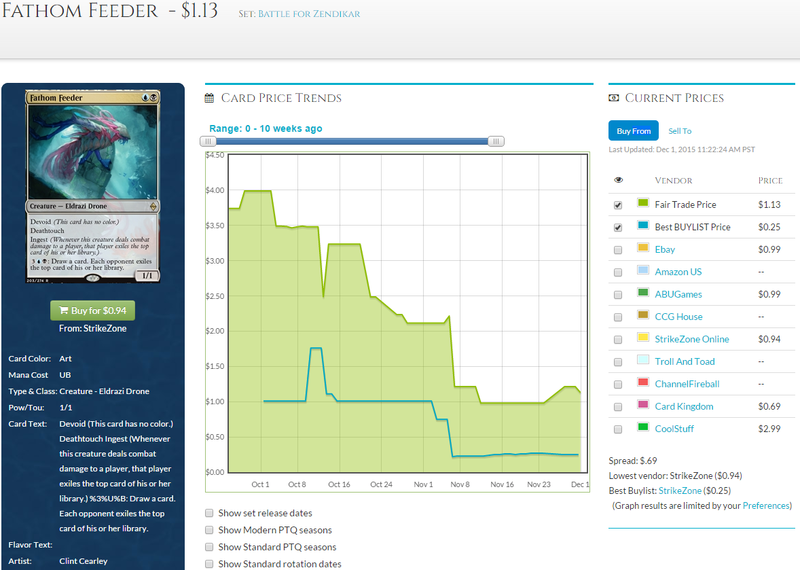 Buying cards at buylist prices is awesome; writing about it can sometimes be another story, though. While EDH, Standard, Modern, and real-world finance comparisons continue to change and evolve based on the new products and information that Wizards provides us, the rules for collection buying largely stay the same. Thankfully, I have at least a few people out there who haven’t stopped reading my content (yet), and are willing to provide constructive criticism. I was having a conversation with one of my readers earlier this week, and he gave me some excellent advice that I think will help me focus on this specific topic more, and by extension I hope that will be helpful to you. I’ve already written on bulk rares quite a bit in the past, and why they’re one of the safest purchases that you can possibly make in the game, as long as you don’t overpay on them. They’re versatile, easy to convert back into cash, and they allow you to bridge the gap between competitive and casual players very easily. I hope that with the hint from the title, and my follow up on that paragraph of helpful advice, you can see where I’m going this week. Well, if you follow me on Twitter then that helps too. Three yes votes? Good enough for me—let’s go. While I’ve extensively covered what I have personally nicknamed “true bulk” rares, I’m going to expend on that topic a bit by giving a closer examination to “fake” bulk rares. The above is a picture of (mostly) true bulk rares. These will have a TCGplayer mid average price tag of 75 cents or lower, and no buylist will touch them as actual distinct cards. Most stores who buy true bulk rares do so at a rate of 10 cents a piece, although sometimes you’ll get lucky and find a vendor shelling out 12 cents at a Grand Prix. These are the vendors that you’ll likely want to cash out to, and I highly recommend Card Advantage (the United States one anyway) for ousting your bulk rares. So what’s a fake bulk rare then? Well, they pretend to be higher then bulk, but only if you take a quick glance at the TCGplayer mid or SCG price that so many players know and love. That price will usually waver anywhere from $1 to $2 depending on the site that you use, but the important number that us financiers care about is the always-precious buylist price. 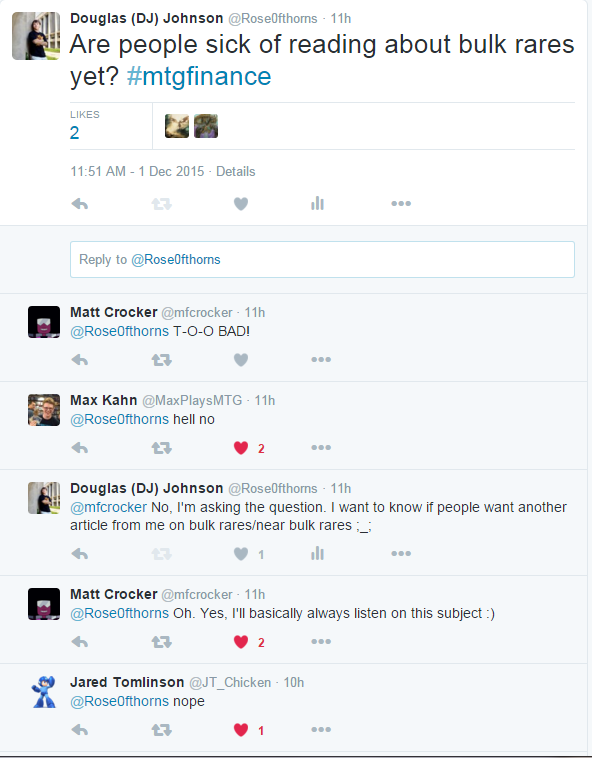 If you’ve been buying some collections, decks, and lots from players as a result of reading my articles, great! I’ve always advocated waiting until you can find things for buylist prices, as it’s usually the most effective way to flip something relatively quickly for a solid profit. Someone needs to sell an Overgrown Tomb to buy a milkshake or pair of comfortable cargo shorts? Give them $3 or $4, then go throw it up on TCGplayer when you get home. What Does This Have to Do with “Fake” Bulk Rares? Instead of shelling out 50 cents a piece on these when Ben the Standard player wants to cash out on the remains of a Battle for Zendikar case that he received as a Christmas present, you lump these in with the bulk rares. If you’re feeling like a jolly Santa, you pay 25 cents. This is the part where you get to choose what to do. You have control over this situation; it’s like one of those Choose Your Own Adventure books that I read in fourth grade (and got like six reading points for each book, even though it’s obviously not a “full book” and I only had to read like 30 pages to get to the end). You can choose to A) Educate him by pointing to this article, B) Explain a summarized version of this article to him and let Ben know that he would be hard-pressed to get even 25 cents for the card, even if he were to sell on Facebook, or C) Don’t bother explaining the economics of everything to him if he seems genuinely offended and expecting to get 50 cents, and just let him keep the card. You’ll notice that I have some other Battle for Zendikar rares in that pile of garbage, like Radiant Flames and Scatter to the Winds. I paid 25 cents each on the Radiant Flames, and 10 cents each on the Scatters. That’s not a brag about how I’m going to make 400-percent profit on each of those cards, because that’s probably not going to happen. Nobody wants to pay the full TCGplayer retail price on a dollar rare like that, unless they’re inside the convention hall on the morning of a tournament and in a desperate situation to find the card. So Why Should I Acquire “Fake” Bulk? I’m glad you asked. While these cards are almost impossible to sell for a significant profit margin, trading these off to Standard players who “need a set” or “might play these in the future” is definitely the play. Because they teeter on the edge of fringe playability in one format or another, you’ll have much more success using them to bump the value of larger scale trades when your partner wants to use TCGplayer mid or SCG values. While I don’t think PucaTrade is the worst outlet for fake bulk at it’s crisp and tasty full value of $1 to $2, it’ll be basically impossible to find a trade unless you’re willing to put in a massive amount of time and effort to upload all of your lower value rares, then use a bot or program to help click your trades for you before they’re gone in an instant. If you happen to be $3 or $4 up on a trade involving Modern and EDH staples and your partner needs to find that amount to cover the difference, grabbing three Scatter to the Winds or Radiant Flames at $1 each can be a quick and easy way to finalize the trade instead of dealing with awkward Modern increments of $5 or $6. Alternatively, you can work up small piles of fake bulk rares into rock-solid casual/EDH cards that can later be sold for a relevant value. One playset of Fathom Feeder for a Blood Artist? Seems fine, especially when our trade partner is a Standard grinder who has no use for a Blood Artist, and might play Esper Dragons in the next couple of months. If you had the option of paying a dime for a Beastcaller Savant or a Pyretic Ritual, where are you throwing your coin? Exactly. 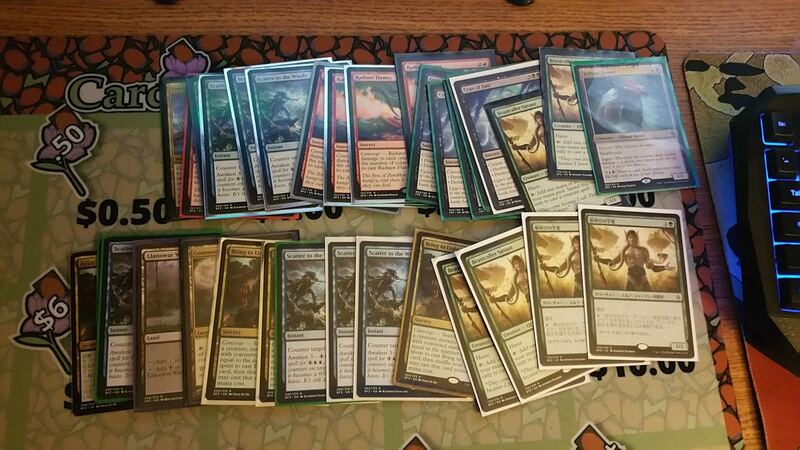 Many of these modern, casual, and EDH commons and uncommons share a retail to buylist spread similar to the fake bulk rares that we’ve been learning about, but it’s going to be much easier to find a buyer or trade partner for a playset of Pyretic Rituals, Brainstorms, or a single Alara tri land at $1 per card than you will for a Bring to Light. 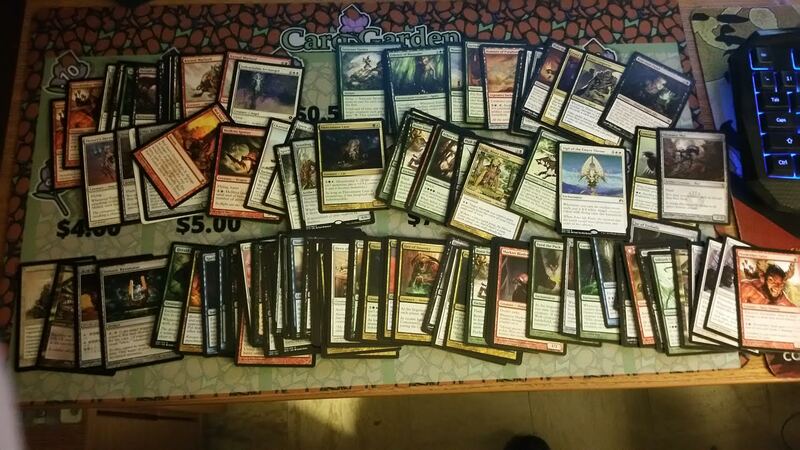 If you have the opportunity to pick bulk and end up with a pile like the picture above, I certainly don’t recommend buylisting off those Rituals, Thought Scours, or Delvers at 10 or 25 cents a piece. It’s fine to play the waiting game here until Modern season rolls around, or until a budding Commander fanatic texts you a list of stuff that he needs, but is too cheap for other players at the LGS to have in their binders. If you have it stashed away like my pile above, you’ll be that player’s hero and make a few dollars for nothing. No “End Step” this week, because I feel like we’ve covered a lot of material already, and all of my other co-writers will have covered the current news to the point where I’d just be beating a dead horse. It feels good to be back and writing about a topic that I think has a shockingly low amount of content, and I enjoy feeling like I’m at least filling some kind of niche in this arsenal of prolific Magic writers. Thanks for reading! 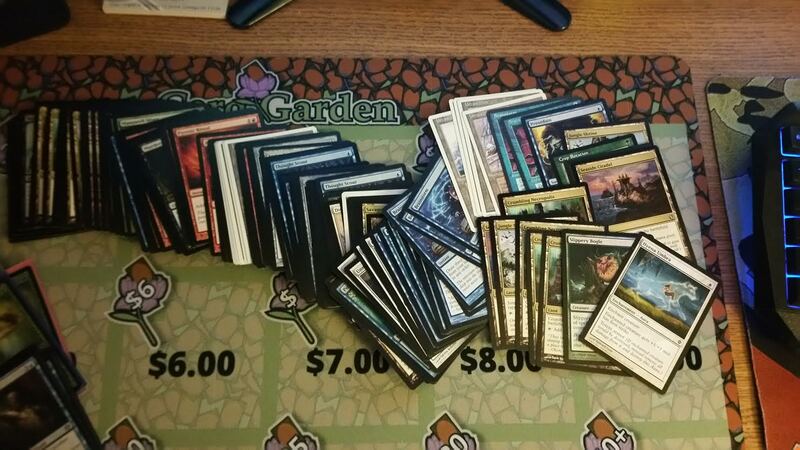 to hold most of my commons and uncommons that are still relevant/in demand and worth less than a dollar. Any reason for the plastic cases for actual card boxes (400/800/1000/5000 count)? They puzzle piece together into my case easier, and take up less room. I do use the 1k count boxes for other cards. Great article, i do love me some gake bulks! Im looking forward to more articles on the subject. First article I’ve read in this series, and I definitely enjoyed it. I could definitely see myself taking the time to deal with bulk cards like these and find buyers for them. Have you encountered people who frown upon this because it may be, I dunno, rude to your LGS? Or do you generally only deal with close friends who understand that you just always have lots of cards (available immediately)? Anwyays, I’m off to start reading some of your other articles. Hey Chad! Sorry, I didn’t see this comment until now. I mostly deal with local friends and repeat customers who know me personally, and it helps that my LGS doesn’t deal with singles. I’m the local “singles guy”, so I have a bit of a competitive edge in that regard. I have had some people who get offended at my numbers even after I explain my margins/thought process, but I think that’s true with any business model. I appreciate the kind words! h my goodness! an amazing article dude. Thankyou Nonetheless I’m experiencing problem with ur rss.